A Secret from the Cellars. The Knappogue Castle is indeed a real castle built by the Irish clan MacNamara in the 15th century to stop the invading Normans. It was left in ruins until 1966, when Mr. Andrews, an American with Irish blood purchased it and began restoring this landmark of Irish culture. Mr. Andrews also happened to be a true Irish Whiskey devotee and started stocking-up his cellars with all kinds of different Pot Stills he could get his hands on. He waited for the Whiskeys to reach the pinnacle of maturation and then bottled it under the name of his hallowed Knappogue. But the real legend was born when his son, Mark, decided to put his father’s legacy and passion on the market. It all started with the Knappogue Vintage 1951, which has become one of the most appraised Whiskeys in the World, giving the brand global recognition. Today the legend continues and the cellars of the castles are serving its purpose just as Mr. Andrews had imagined. 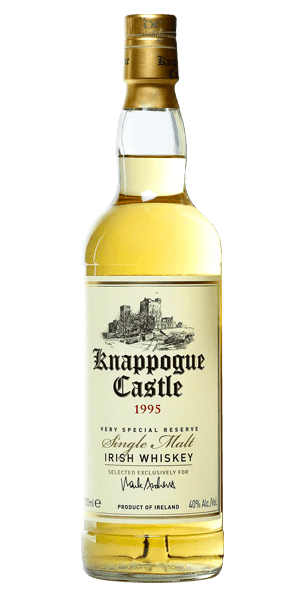 Knappogue Castle a single malt distilled at Bushmills in 1995, matured in ex-Bourbon casks and bottled in 2008. It is the special Bourbon casks used in this particular year that give it a full body and soul known only for this edition. Don’t miss out on this Irish knock-out! What does Knappogue Castle 1995 taste like? The Flavor Spiral™ shows the most common flavors that you'll taste in Knappogue Castle 1995 and gives you a chance to have a taste of it before actually tasting it. The balance is strong with this one sailing between the fruity and spicy sensations. From the fruity and spicy impressions we come to creamy, nutty and malty taste. A strong and compelling finish that could be expected from even older drams than this one. Oak, Sweet, Vanilla, Malty, Barley, Sugar, Dry, Cocoa, Smooth, Oily, Honey, Creamy, Floral, Cereal. Fruity scent. A bit like a ripe pear. This is the first Irish whiskey i've tasted. And it's still my favourite. So very lively and smooth!